In February 1916 the German Army, led by General Falkenhayn, launched a major offensive against Verdun on the Meuse front. Thus began one of the most bitterly fought and costly battles of the First World War, lasting seven months and resulting in 700,000 casualties. Verdun, well protected by a ring of fortresses in the surrounding hills, was never captured. The following night a last desperate suicidal relief attempt failed with heavy loss of life. Meanwhile Reynal had been informed by his Quartermaster that water supplies had run out. Reynal realised that surrender was inevitable to relieve the sufferings of his men. So at 06.00 hours on the 7 May the white flag was raised. Major Raynal was immediately interviewed by Crown Prince Wilhelm, congratulated on his gallant defence and allowed to keep his sword. 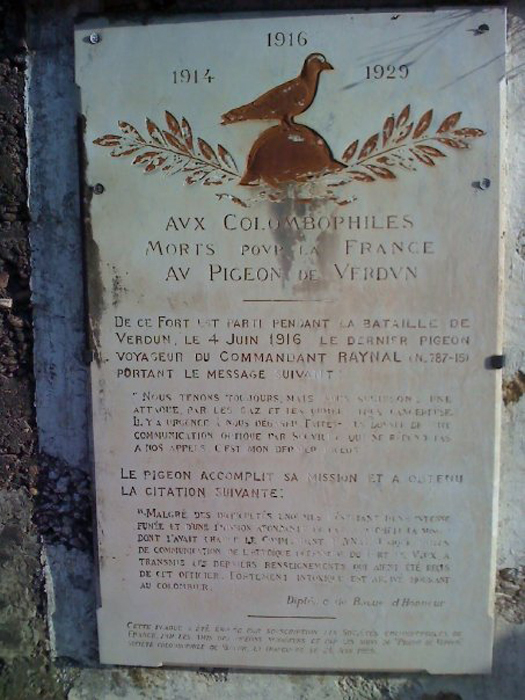 After the war in 1919 a memorial to the gallant pigeon was erected on one of the fortress walls where it still stands today. After listing the units involved in the siege there is a brief summary of the sufferings endured, and the Croix de Guerre citation is given underneath. At the top perches the pigeon standing on a steel helmet with a palm frond in its beak. Nearly 20 years later in April 1936 a much larger and more impressive memorial to pigeons was dedicated by General Gamelin in Lille. The money was raised by the French Association of Pigeon Fanciers and commemorates the 20,000 pigeons killed in the war. Also on the memorial are named pigeon fanciers in the Lille area who were executed by the Germans for keeping pigeons against orders during the Occupation. Presumably the Germans assumed there were spies hidden in Lille who could send information to the French High Command by using these pigeons.anist for many years. Upon his retirement from that position, he was appointed Organist Emeritus.